During Christmas, many people choose to decorate their tree based on a certain color. Before you choose which beautiful color you want to adorn your Christmas tree, read some fact, and some interesting points regarding each color! Each color has its own meaning and its own personality. No matter if you are decorating based on what the color means, or you simply enjoy that color, we want you to see some of the points that personify each color! Orange is a passionate color, resounding all throughout the word. The color is the midway point between red and yellow. Orange is seen all over, and is notably the color of many professional and collegiate athletic teams. The color orange is also heavily seen in flags of countries, and for very different reasons. Ireland has orange in their flag, to remember a king. India has orange in their flag to represent Hinduism. As you can see there are many definitions of orange wherever you are in the world. The definition that is widely known for orange is that of fire. What would man be without fire? It is what gave us heat in ancient times, before modern technology. Fire allowed us to eat different kinds of food. Fire is the reason for survival. Orange represents an essential source of life for all of us. In Christmas ornaments, why not include this wonderful color in your décor? 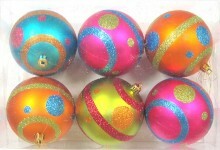 Orange is the perfect color to use in your Christmas ornaments! With Winterland Inc. you not only can show off the beautiful color of orange, but you can also rest assured that our ornaments will meet your high standards for quality, and beauty. We pride ourselves in making the best ornaments possible. The orange ornament collection is a fireball of color, and we strive to ensure that the beauty of the color is matched by the quality of the product!